While the nations of the world tussled with the official documents and the statements and proclamations at the Rio+20 Summit, a vigorous Peoples’ Sustainability Treaties movement had begun to take shape—presenting an alternative, grass-roots view of what people think sustainable development might look like. The Peoples’ Sustainability Treaties (PST) were initiated by civil society organizations to develop collective agreements for sustainable futures beyond Rio+20 and a post 2015 agenda of the multilateral system. 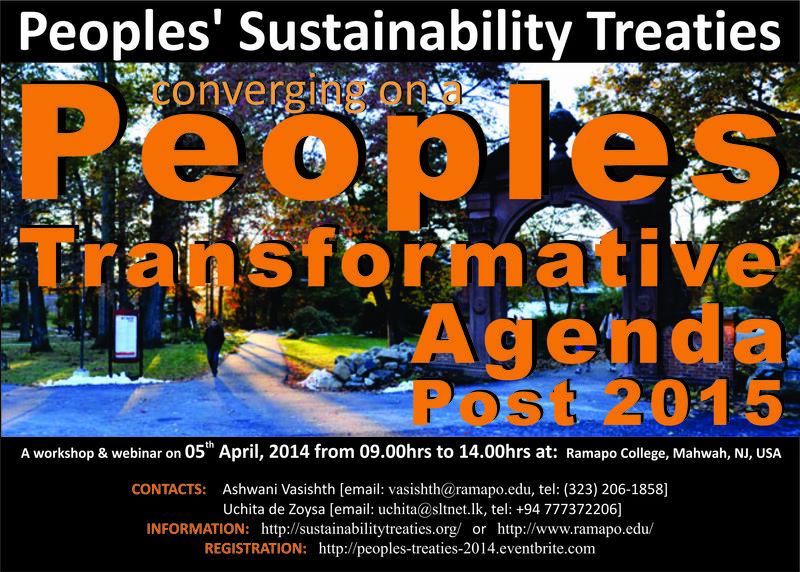 The PST’s are evolving a new narrative and agenda towards the transformation to a sustainable world order, providing a common platform for a collective global peoples’ movement to emerge. The PST process leads us to a deep investigation into social and natural science perspectives such as distributed leadership, collective action, resilience, the ‘commons’, and subsidiarity come into play as alternative frameworks for the well-being of all. Leida Rijnhout (Netherlands) is Global Policies Director at the European Environmental Bureau and leads the Global Policies and Sustainability unit. She studied cultural anthropology and has years of field experience in development cooperation. Before, as the Executive Director of ANPED – Northern Alliance for Sustainability, she advocated the “strong sustainability” approach at the UN, OECD and EC. She also led an international working group on ecological debt and environmental justice. Her principle focus is on ecological economics, the sustainable economy, sustainable consumption and production and resource justice. She is the Organising Partner for the NGO Major Group, facilitating their participation in the SDG/post 2015 process at UN-level. She is Dutch and speaks Dutch, English and Spanish. Yuxin Hou (China) is a postdoctoral research fellow at the NGO Research Center, School of Public Policy and Management, Tsinghua University, Beijing, China. He earned his doctorate in Anthropology in Peking University in 2012. He is the honorary membership of the Indigenous People’s and Community Conserved Territories and Areas (ICCA) Consortium anda also the member of Brazil and Bhutan Learning Journey, Global Wellbeing and GNH Lab—Innovating Beyond GDP, 2013. His principal focus is on the study of social anthropology, visual anthropology, disadvantageous people, nomadic peoples, GNH , NGOs and civil society, etc. He pays much attention to the implementation of the alternative way of GNH and the fate of disadvantageous people in China including the disadvantageous ethnic groups such as Tuva, etc. Rob Wheeler (USA) has represented several organizations at the United Nations for the past 16 years including Commons Action for the United Nations, Planetafilia, and the Global Ecovillage Network, and the World Alliance to Transform the UN. He has participated actively in the UN’s Commission on Sustainable Development during this time. Rob developed and organized a Sustainable Community Campaign in Santa Cruz, California for five years in the 1990s; was the primary civil society representative on the UN’s Initiative on Access to Basic Services for All; and served on the Executive Committee for the UN’s Millennium NGO Forum. Rob taught environmental education for more than ten years in Outdoor Education Schools, UC Berkeley’s Summer Science Camp, and Youth Conservation Corps programs. He is a foremost advocate for an integrated, multi-sectoral community based approach to rural and impoverished urban development; and often claims that we need to plan to make a complete transition to full sustainability as rapidly as possible. Helene Finidori (Canada) is a researcher on systemic change and collective human action. She has a background in business strategy and communication and teaches management and leadership of change on the international program of Staffordshire University in Barcelona. She has been part of Commons Action for the United Nations since 2012 and has contributed to the setting up the Commons Abundance Network (CAN) in 2013: a co-learning, research, innovation and action network operating both offline and online as a laboratory for transformative action towards commons based abundance. Within the framework of the CAN, she is exploring the archetype of the commons (and in particular growth of the commons) as underlying logic for the convergence and the vetting of sustainability initiatives, leading to the design of a pattern language as building blocks for commons growth. The Federating efforts towards a thriving world presentation is an introduction to this integrative yet distributed approach. Richard Jordan (USA) was the 60th DPI/NGO Conference Chairman. Over the course of his 22 years at the UN, Mr Jordan has represented a number of NGOs affiliated with DPI and ECOSOC, most notably Global Education Associates and currently International Council for Caring Communities. Among his most notable achievements is having been one of the five co-founding editors of the Earth Negotiations Bulletin (ENB), the journal of record at environment and development meetings worldwide. Richard has also been a member of the Board of Directors of the NGO Committee on Peace, Development and Security, Symphony for United Nations and Friends of the United Nations, and is the Chairman of the CONGO NGO Committee on the UN and Sports.Outside the UN, Richard has served as an elected Trustee of the Cathedral of St. John the Divine and the National Arts Club and serves as President of Concerned Citizens Speak, a 26-year-old non-profit city-wide citizens organisation.